The Costa del Sol is known for its wide choice of street markets – or flea markets, as they are sometimes referred to. As visiting these markets seems to be on most of our guest’s to-do lists, we thought we’d put together a short and concise guide featuring the most popular markets along the coast. Many of the local street markets combine flea markets and boot sales, so for the sake of this guide, we’ll just refer to all as street markets. Although we haven’t included all the markets which take place throughout the week, we have tried to add all the ones that we’ve actually been to and that our guests have recommended. So what can you expect to see at these street markets? Well, it depends on the actual market as some are geared more towards holiday makers and others are where locals go to stock up their fridges!!! There is a common theme to all though; there are some great bargains to be had! Opening times tend to differ, but most open at 9:00am and stay open until 1:00 or 2:00 pm – if you look to get there for around 10:00am, you can’t go wrong. Marbella – Every Monday morning in the town’s main fair ground (near the car dealerships at the entrance to Marbella). You’ll find a bit of everything at this popular market. If you’re driving, parking could be a problem! We recommend trying to part down by the fishing port and walking up to the market. Fuengirola – The Fuengirola market is held at the Fair Ground in the town centre. Parking is a problem but it’s worth the hassle as this is one of the biggest of the Coast’s markets with loads of great stalls. You can get a bus straight to Fuengirola (nº120) from just outside Sunset Beach Club. Benalmadena Costa/Arroyo de la Miel – Located at the fairground behind Paloma Park, this one is a favourite amongst our hotel guests as it’s within walking distance. Please be advised that this is more of a car boot sale than a traditional flea market. La Cala – Located in the fairground just off the A7 coastal road in La Cala de Mijas. You’ll find a bit of everything at this market. Estepona – Located next to the fair ground. Again, this is quite a big market and one of the most popular in the area (western Costa del Sol). Torremolinos – Located next to the Water Park. Just a short taxi ride from Sunset Beach Club. San Pedro de Alcántara – Another popular market and well known for its great variety of fresh produce. Parking is a little easier than at some of the other market venues. Puerto Banus – Although a bit further down the Coast (45 minute drive) this has to be one of the most popular and visited markets on the Costa del Sol. Lots of great stalls as well as a wide selection of antiques on sale. Parking can be a problem; we recommend you park in one of the car parks in the main port area and then walk up to the market. There are lots of cafés and bars around the market where you can enjoy a drink and a bite to eat. Torremolinos – Near the Water Park. Fuengirola – Located near the Mosque and the Sohail Castle. This is more of a flea market with lots of leather goods, souvenirs and gifts. 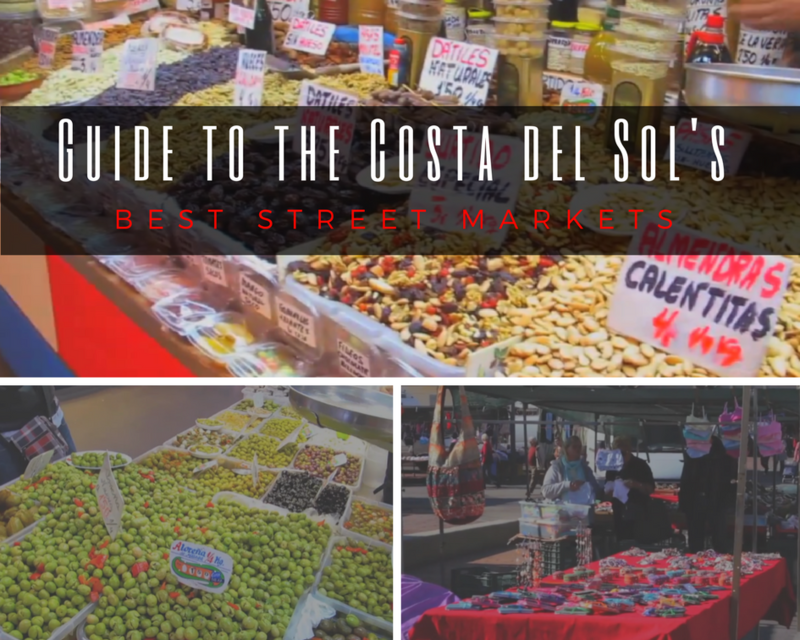 So there you go, our quick guide to the best street markets on the Costa del Sol. A quick word of warning, as in all popular tourist attractions, there are pick-pockets around who pray on the innocence of some tourists so please be careful with your wallets, bags and belongings! Another quick pointer: Prices of products on sale at the street markets are usually fixed but we recommend you try and barter a little, you can usually get some very good deals! Have fun and don’t spend too much! Note: For more information about the local street markets, please ask at the Leisure Desk on the 6th Floor of Sunset Beach Club. And if you’re looking for somewhere to stay on your next visit to the Costa del Sol, be sure to check out our great-value seafront apartments at www.sunsetbeachclub.com! I think your page should make it clear that the Wednesday market at Benelmadena and the Saturday one at Fuengirola are really huge car boot sales. There is no way you could find “nice souvenirs for your friends and family” unless you really don’t like them very much. The Tuesday Fuengirola market is a proper one. I believe it’s closed on the 1st January Claire. Thank you for your comments and feedback Barbara. We’ll be sure to change the post to reflect this. I arrive at about 10/11am on the Tuesday morning. Will I be too late to go to the market in fuengirola? Is this same market on another day somewhere else? The market is usually open til around 2pm so you should be able to make it. Hi Margaret, the Feria is in Arroyo de la Miel so the Fuengirola Market should still be on. Hi Justin. Thanks for all the info. I will be in Torremolinos from Sept 8th for 3 weeks. I was really hoping to find a local fresh food/fish market. You mention San Pedro de Alcantara. Is that my best option or do you know of another? Many thanks. Niall B. The bus that passes your resort to Arroyo de la Miel is the 103. The L 2 has not run for a few years. Does anyone know if the train station is near the benalmadina market please? The Friday market is near the Arroyo de la Miel train station, the Wednesday one is a short walk away. We have found out that the Wednesday market at Arroyo (or giant car boot sale if you like) does NOT operate on Spanish bank holidays. Today (15th August) is a bank holiday and there was no market happening. I’m afraid we don’t have contacts but would think you’d need to contact the town halls in each of the different towns/cities.